"We come from Tangshan (in North China's Hebei Province) ... you will have bread. You will have homes," Dong Huijuan, the first person in China to get a doctorate in disaster psychology and a survivor of the 7.8-magnitude earthquake that struck Tangshan in 1976, exclaimed in a gymnasium in Mianzhu, Southwest China's Sichuan Province which was being used as a shelter after a massive earthquake hit the province in 2008, killing 69,227 people. The name of "Tangshan," the city which had to rebuild itself totally after being decimated by the earthquake, might have been the tranquilizer of the Sichuan survivors. Dong, then a 15-year-old girl, was one of 4,202 children orphaned when a massive tremor ripped apart Tangshan at 3:42 am on July 28, 1976. It claimed the lives of more than 242,000 people, including Dong's parents, her older brother and his pregnant wife. Despite being left with three caring sisters, Dong often reminded herself of the cruel fact that "my sisters are not my mother," when she was upset. Over the past four decades, numerous survivors of the quake, including orphans who were left alone in the world, have been haunted by anxiety and depression. After she became a psychologist, Dong learned how to better manage her trauma and how to help other victims alleviate their pain. A 10-year-long survey of Tangshan quake victims including orphans, those left severely disabled and those whose spouses died, conducted by the Kailuan Mental Health Center in Tangshan in the years since 1996 showed that the proportion of Tangshan residents who suffered from neurosis, anxiety and phobias was much higher than in other areas, The Beijing News reported. Many victims understandably did not want to discuss the disaster and some even felt anxiety or even panic when the topic of earthquakes in general was brought up, Dong said. Their mental health problems would often become particularly acute around the annual anniversary of the disaster and the Qingming Festival, traditionally a time for ancestor worship in China. Orphans who were left with no close relatives tended to be insular and unwilling to ask for others' help, Chang Qing, a photographer who has recorded the trials faced by the city and its people for 40 years, told the Global Times. Longing for a family, many married early; but their divorce rates are also much higher, Chang said. Dong explained that these lone orphans are prone to emotional instability and explosive outbursts, without worrying about the consequences. "They are inclined to believe that there is nothing more to lose, as they lost everything in the earthquake." Dong herself finds it hard to discuss her family. She was overcome with emotion several times during the interview with the Global Times, blinking back tears discussing them and the hardships she faced. Dong, whose son was born prematurely, said that she especially missed her mother during her pregnancy and when the boy was young as she had no source of maternal experience and support to draw upon. "Nobody could help take care of my son," she said, explaining that at that time she was also burdened by work and postgraduate studies. 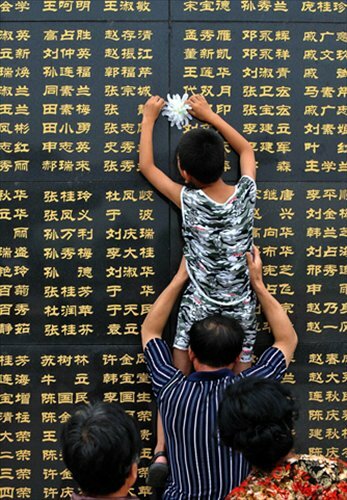 Back then, she often went to the Tangshan Earthquake Ruins Memorial Park where a huge black wall is engraved with the names of tens of thousands of victims. "That is like their tombstone," Dong said. "There is no other place to mourn for my parents." The rescuers who pulled the corpses of her mother and father from rubble three days after the quake told her that they were taking the bodies of her parents and everyone else who died "far, far away,"she recalled. "I never admitted that I was an orphan before the 8.0-magnitude earthquake jolted Wenchuan county (Sichuan) in 2008," Dong recalled. "It is a scar I do not want to disclose." She believes that not having access to any psychological help has further scarred the survivors of 1976. In an attempt to help Wenchuan's survivors heal, she conducted psychotherapeutic interventions, leading a 14-member psychological rescue team from Tangshan on May 15, 2008, three days after the quake. When she saw a boy hunting for books among the debris, she told the authorities that they should set up makeshift schools as soon as possible. "When students go back to school, their parents will divert their attention to their children and restart their work - society can then remain stable," the psychologist explained. The first portable school was completed on May 18, 2008. Another case that motivated her was that of a 17-year-old girl, who hid in a tent where the temperature was around 50 C for 21 days. "Could you help me put on dresses again?" asked the girl, whose right leg had been amputated. "You are able to, certainly able to and must be able to [wear dresses]," Dong told her determinedly after minutes of therapeutic intervention. In the scorching sun, the girl came out of the tent on crutches before throwing them away and finally hopping over to Dong on her remaining leg. "I'm not crying for my leg, but for finding you," the girl wept while tightly hugging Dong. The girl is now the manager of a hotel. More than 2,000 students in the quake-hit areas that were tracked by Dong's team showed high rates of anxiety, fear, depression and paranoia in the years after the earthquake, but as of 2011 they showed no greater signs of mental illness than average. The success of Dong's psychological interventions in Wenchuan has made Dong all the more determined to push the frontiers of disaster psychology. Apart from the humanitarian aspect, helping others overcome their trauma seems to relieve the pain of her own loss.